"�I take this same train every week at this time�"
The mournful whistle of a ghostly locomotive heralds the approach of The Mysterious Traveler. Maurice Tarplin plays this blithesome bringer of bad tidings and terrifying tales. 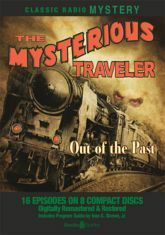 From out of the past he brings stories of suspensefully unsuitable spouses, treasure hunters and time travel, the mysteries of the dead and their designs on the living, and the future�as imagined by a former generation. Raymond Edward Johnson, Bret Morrison, Elspeth Eric, Frank Readick, Lesley Woods, and Academy Award winner Art Carney give voice to villains and victims created by Robert A. Arthur and David Kogan. Includes 16 digitally remastered episodes and a Program Guide by Ivan G. Shreve, Jr.